Selecting a camera bag can be a daunting task. We are all looking for that bag that will do it all. Be that silver bullet for us so that we only have one bag that fits everything we would ever need. However, there are several instances where certain bags just aren't appropriate or are too much for what you are doing. If you are doing a day hike somewhere, there is bag for that. If you're traveling on the airplane, there is a case for that. If you're running down to the park, then there is a small bag for that too! What you will realize is that every photo doesn't require every piece of camera gear you own. Plan your shoots, get an idea of where you are going and what you might photograph, then pack your bag accordingly. I have owned a LOT of camera bags, but I was able to get rid of a lot of them when I finally ponied up the money to buy the Mindshift Gear Rotation 180 Horizon. It's an expensive bag, but it's made extremely well and is versatile enough to use for just about any style of photography. The standout feature of the bag is that the entire lower section of the bag slides around in front of you for quick lens swapping without even taking the bag off. It's awesome! I also like that the bag itself is quite lightweight, yet big enough to fit comfortably. I also like that the bag safely stores a laptop, which is surprisingly a rare feature in a lot of camera bags. I also like that this bag is the PERFECT carry-on bag size for traveling with photo gear. While US airlines allow pretty large bags as carry-ons, most international flights do not, so having a bag like this one that always works as a carry on is a nice bonus. It even fits in the overhead compartment in the smaller regional jets. This bag comes in several sizes, but I think the Horizon is the perfect size for most photographers. 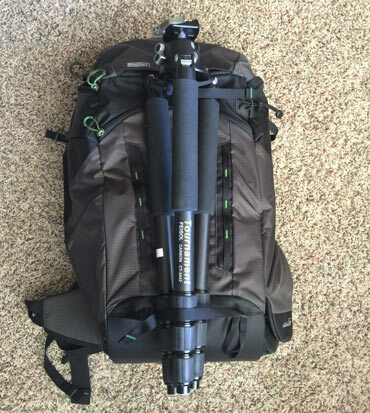 It will even fit a 70-200 attached, but it's not too large of a bag. There are many less expensive camera bags, but this one will last you 5x longer, and will be far more comfortable and versatile. Read my full review of this bag, and then go check the price of the Mindshift Gear Rotation 180 Horizon on Amazon. Not all my gear fits neatly in a backpack. When I'm traveling to a conference or around the world to shoot for a week, I often need to bring a full set of flash photography gear or another camera system with me. For that, I use my Pelican 1514 case. It's an unbelievably durable and rugged rolling case that fits quite a lot of camera gear with handy dividers inside. The case is waterproof and you'd be hard-pressed to find a way to crush it. I like it because I can check some camera gear without worrying about it getting ruined. I also like using it for road trips when I know there will be other stuff in the trunk and I don't have to worry about something rolling over onto my gear and damaging it. The 1514 is a heavy case all by itself so it'd be a poor choice for shoots where you'll have to carry the case, but if you'll be in places where you can roll, the 1510 is fantastic. Just about every professional photographer I have ever worked with owns at least one of these cases. Most photographers buy the Pelican 1510 case, but I like the 1514 better. The 1510 doesn't fit some full-size bodies on their sides, so you lose a lot of space on the bag. The 1514 fits larger bodies more comfortably, while still fitting the maximum carry-on size for most airlines. It's worth a few extra bucks. 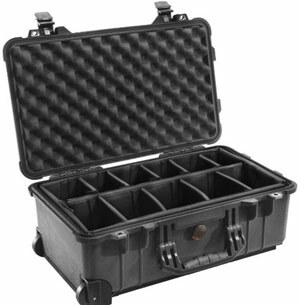 Buy the Pelican 1514 case with camera dividers on Amazon.com. I've long used my Tenba messenger bag as my “daily driver.” It carries my laptop and a camera body with a couple lenses just about everywhere I go. When I go to give presentations or speak at conferences, it's the bag I use the most. If you travel for business and want to bring a small camera bag with you, this is what you're looking for. A messenger bag is also a smart choice for street photographers who want a quick access bag that doesn't scream “I'm a photographer!” Not only is it discreet, it's quite good looking. While a hiking style backpack may be more comfortable for serious travel, a messenger style bag is more discreet and allows you to keep a hand on the bag at all times so nobody comes behind you and steals something out of the bag. The Tenba Messenger Graphite comes in several different sizes. My favorite size for this bag is the DNA 13. It fits most smaller laptops (including my Mac Air) as well as most cameras and a couple lenses very comfortably. It's just the right size for most photographers. Buy the DNA 13 on Amazon. If you have a large full-frame DSLR with pro lenses, or if you want to carry a laptop larger than 13″, then I'd recommend getting the larger “DNA 15” bag (click to buy on Amazon). If you're looking for a lower-cost alternative or a smaller bag for just the absolute essentials, then we'd recommend the Ape Case 1815W. I have not used this bag personally, but our hobbyist editor, Jeff Harmon, is always looking out for the low cost but high quality gear for hobbyist photographers and he loves this bag. The bag is a stand-out because of its easily manageable size, and unparalleled gear access with top, side, and back zippers to get to your camera gear quickly. I also like to see that it has a built-in waterproof cover that you can slip over the bag in inclement weather. As I travel the world to shoot with readers of Improve Photography, I always recommend that participants bring a bag with a rain cover like this one. We shoot in some pretty nasty weather conditions, and you want to make sure your gear is protected so you can stay out and shoot. This is a small bag, so don't expect to fit a full frame camera with pro glass, but if you shoot a crop sensor DSLR or mirrorless system with just one or two extra lenses, then this is a very durable and lightweight option. Buy the Ape Case 1815W on Amazon.com. What do you think about the Tamrac Evolution 9 bag? @Carlos – Sorry, I haven’t tried that bag yet. You might look at the fstop bags. They are pricy, but have interchangeable internal camera units so you can take as little or as much gear as you want and use the rest of the space for other things. Just returned from a two month European Mediterranean tour and my two year old Fastpack 250 show no signs of wear. Maybe the quality of mine is hardier because it cost $140 AUD where I live, or maybe I’m not all that hard on gear. I agree that there is not one bag that does it all, but this comes close. They come in three sizes too with the largest able to fit a 17″ laptop, but you better be fit because even my 1.3kg 13″ Acer Aspire S7 made my 250 bag feel like an anchor! If anyone’s looking for well made affordable bags, look at Crumpler. They are designed by a couple of lads in Australia. I must admit I agree with one of your other reviewers. You really should make mention of fstop bags. I have purchased dozens of bags, trying to find the perfect one. There is no such thing, I have come to realize. However, the best so far, although pricey, are the fstop bags. I have 2 and with the interchangeable units, I can mix and match. I haven’t loved the FSTOP gear. They don’t do as well with making the gear easy to get to. Just my personal opinion. Jim Harmer, What happened to ur #1 ranked click elite sport bag @jimharmer ? Happy to hear you like the DNA 13 bag. Thanks for the review. Do you have a recommendation for camera bags to travel abord aircraft with? I am trying to decided between the Tenba Messenger DNA or one of the Domke messenger style bags. Have you’ve had an experience with Domke bags? And if so, what was your opinion of them? PS: I love your website! I purchased your lightroom 101 videos and boy have I learned so much! I even don’t mind editing photos anymore (something I use to dread and thus have old photos just sitting in my hard drive collecting dust). Thank you again for all your excellent and helpful information! Just curious how the tenba insert fits in your Mindshift bag…I have the ultralight 25L bag which takes the same insert as your Rotation model…but doesn’t fit the Temba (13″ is too wide)…. I spent a LOT of time investigating camera bags which would protectively hold a mirrorless camera with a couple of extra zoom lenses as well as other “stuff”. I ended up purchasing a ThinkTank Spectral 8 (the 10 is also a winner). 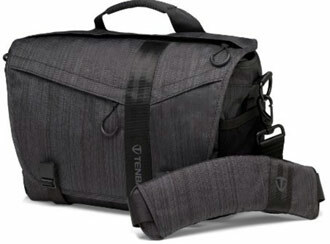 Here’s the website for it: http://www.thinktankphoto.com/collections/spectral-series-shoulder-bags/products/spectral-8. This series is brand-new and very smartly designed — as well as not being all that expensive. the article is very interesting ! i like go to the mountain and go to everywhere and live confortable. Over the years Ive purchased so many camera bags that I’ve lost count! I do like the look of that Tenba DNA Graphite Messenger Bag though!